GuestMode iOS 7: Add Guest Mode to Your iPhone and Control Access! GuestMode iOS 7 jailbreak tweak adds the Guest Mode feature to your iPhone – as apparent from its name. Highly anticipated, GuestMode iOS 7 is now available on Cydia. Here are the details of what it does and how it works! GuestMode iOS 7 jailbreak tweaks adds a guest mode button to the lock screen. When you tap on it, it gives access to the iPhone’s home screen to people you don’t want to share passcode with. You can restrict the access to the apps and iOS features from the settings. Want to gives access to Control Center but not Notification Center? Edit access of Spotlight, Siri and various other along with restricting to close apps from the app switcher! If you don’t tweak the settings of GuestMode iOS 7 jailbreak tweak, it will simply grey out all the apps by default and thus any person trying to access your iPhone won’t be able to access the apps. From the Settings app, you can only edit the restrictions but also change the position of Guest Mode button on lock screen or even set a different passcode for the guest mode. Because of dedicated passcode, only authorized people will have the access to the device and not just everyone. You can get GuestMode iOS 7 JB tweak from Cydia for $0.99. 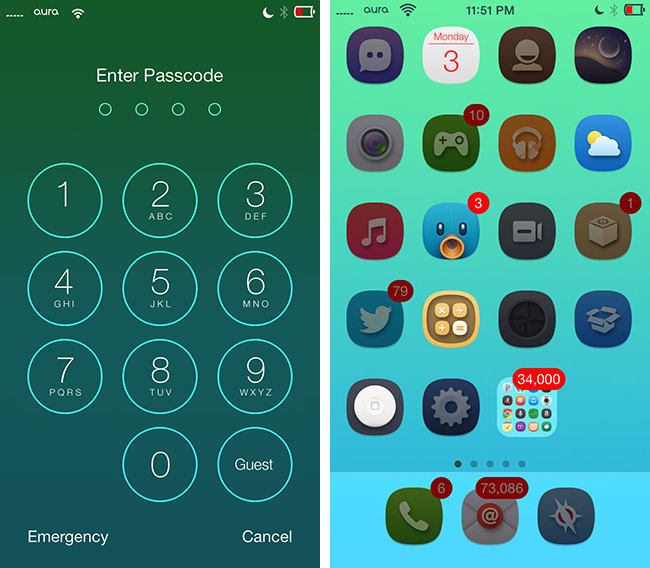 * Weatherboard iOS 7 Theme for Weather-Based Animated Wallpapers!